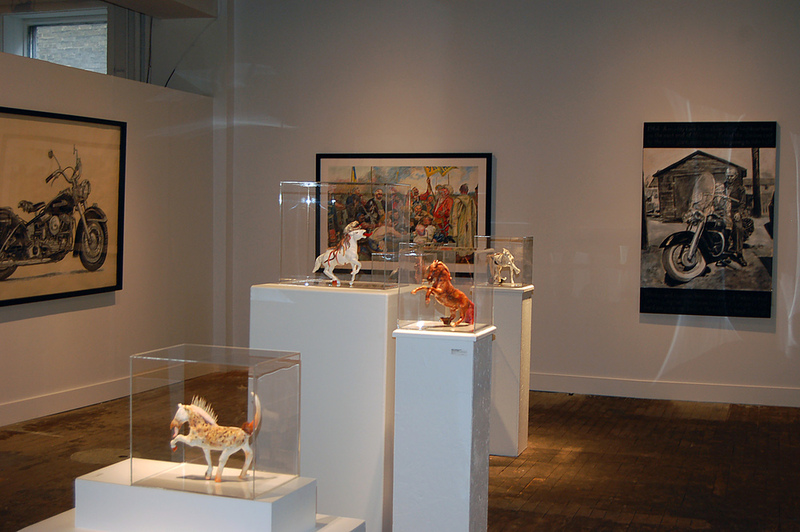 "Some couples play bridge or rob banks, we exhibit together," says Michael Boss of his relationship with Diana Thorneycroft. Despite collaborating on projects for over 20 years, the two Winnipeg artists’ approaches to making art are in complete contrast. While Thorneycroft's work challenges us with the darkness that lurks in the human consciousness, Boss gives us conviction and solace. Together the two are a perfect match. Hogs and Horses is the couple’s fifth collaboration. The exhibit opens on October 3rd, 7:00PM and is on display until October 25th. 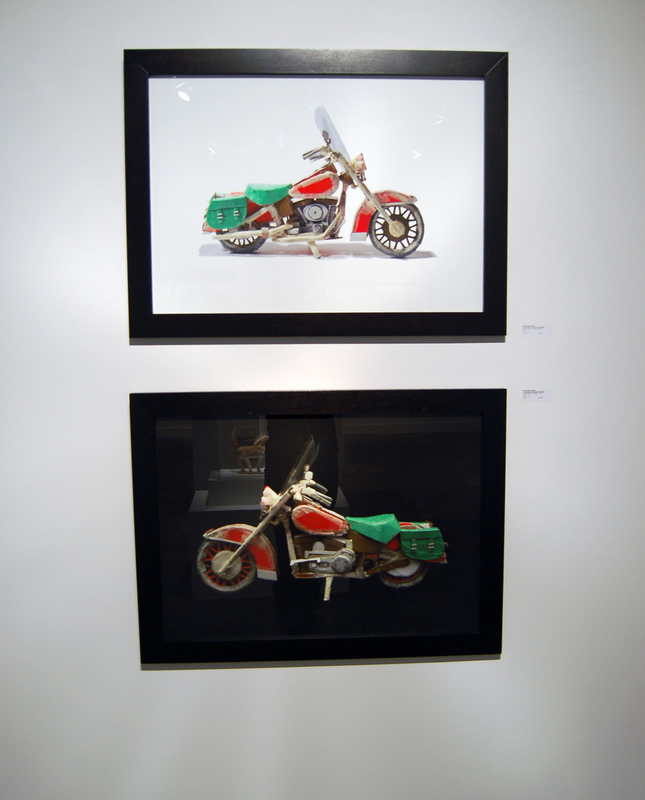 Diana Thorneycroft, Rabbitfoot Black, Mixed Media, 12" x 14" x 12"
Hogs and Horses focuses on Thorneycroft’s morphed plastic horses and Boss's series of drawings, photographs and mixed media pieces that highlight his passion for motorcycles. On the surface the common link between these two bodies of work seems to be "transportation". Yet, the true underlying connection is "obsession". 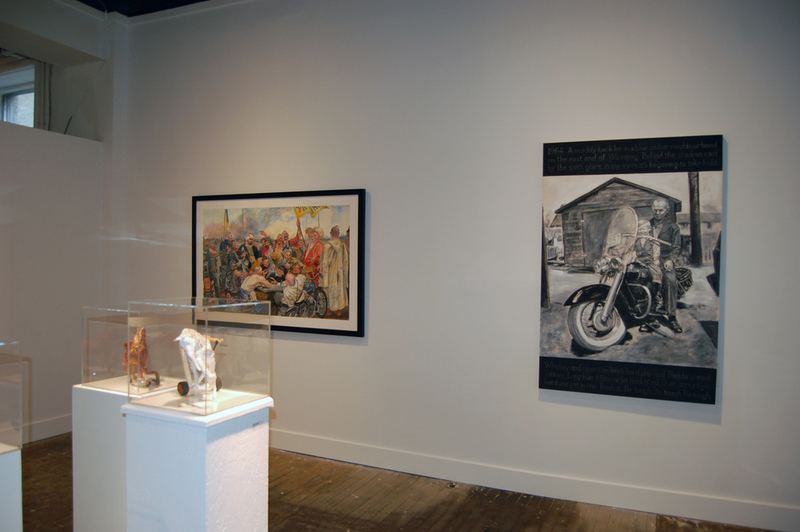 Both artists have spent the better part of two years investigating their respective subject matter. This fascination is clear in the breadth and depth of the two dozen pieces presented in Hogs and Horses. 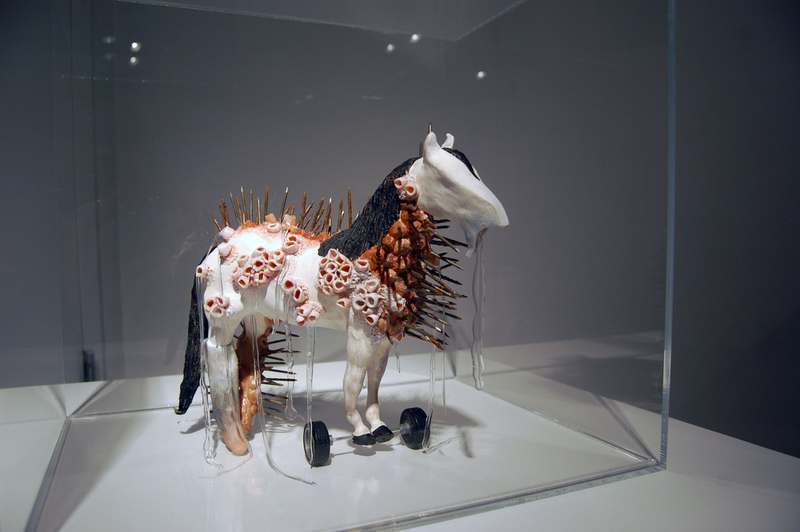 Inspired by Thorneycroft’s interest in West African vodun culture, each of her manipulated plastic toy horses have the potential to become a container invested with meaning. Protruding from the horses’ mouths, which were altered to appear open, is a temporary tongue. When the tongue is removed, the empty cavity allows the owner to place a small magical/memorable object in through the horse’s mouth, eventually, landing in its belly. This process of activation, which becomes permanent once the tongue is glued in place, turns the sculpture into the owner’s personal talisman. Thorneycroft’s alterations to the plastic toy horse go beyond changing their mouths, and through additional alterations, the horse-ness of the animal disappears and a hybrid “other” takes its place. Boss, in contrast, bares his fascination with motorcycles and the mystique that surrounds them. "I have been obsessed with motorcycles since I had my first ride on my uncle Len's Harley at age 4,” says Boss. The experience naturally worked its way into Boss’ art. 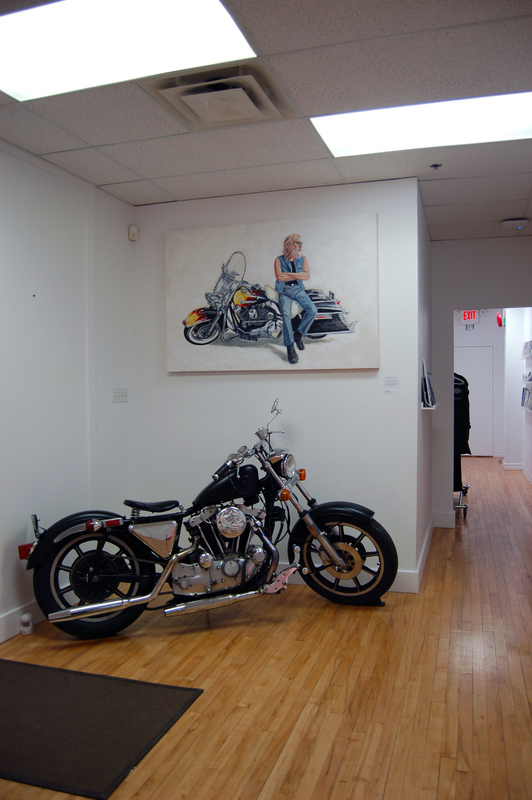 The large-scale oil pastel drawings of his own bikes and those that appeal to him are part of this complex nostalgia. Boss also constructed a cardboard motorcycle using a shoebox, masking tape, duct tape and a plastic water bottle. The end results are not unlike the models from his childhood, bursting with reminiscence and excitement. The two artists challenge our notions of what is weird and what is wonderful. Together Thorneycroft and Boss’ prove that when artists collaborate the extraordinary happens. Although I am mostly known for being a photo-based artist, for the last two years, I have been making sculpture. This shift in my practice was partially influenced by an event that took place when I travelled to Shenzhen, China three years ago, and encountered people with horrifically abnormal bodies, all begging for money in a large market area. The spectacle of their disfigurement was remarkable. My desire to photograph them was tempered by the discomfort I felt when I considered participating in their exploitation. I was reminded of freak shows and the allure of the “other” and felt culpable for being curious about these ‘performers’ with their aberrations. The experience in China led me to a new field of research. In order to comprehend the universal appeal of visual abnormality and my own contradictory emotions, I began reading about the history of freak shows, disability theory and the representation of difference. Although I am still learning, I now have a better understanding of the complex issues surrounding heterogeneity. As an artist, I want to make work that reflects the tension one experiences when encountering “otherness”. In the past I have used dolls, animal carcasses and action figures as surrogates for the human form. With this new work, I chose the ubiquitous plastic toy horse, made by companies such as Breyer and Mattel. When I started altering the toys, I simply covered their bodies with fabric, but in time, the changes became more severe; limbs were cut off, prosthetics attached, and new skins of various materials were adhered to the plastic. When I began melting the horses in an oven, which drastically morphed their shape, the original horse-ness of the toy receded and a strangely beautiful hybrid took its place. In their disfigurement, the horses began to successfully exude “otherness”, and embodied much of what that word implies. In addition to theories about visual difference, my appreciation and understanding of African vodun botchio figurines has also contributed to this work. The custom of using figurines to protect oneself and family was once a common practice, especially in western Africa. In the Fon culture, for example, a carver would be hired to make a wooden figurine that roughly resembled the client’s human form. Following its completion, the next phase would be the employment of a shaman, who would activate the carving by embellishing it with various materials believed to be magical. Sometimes a cavity would be made to house a specific medicine and then sealed in place with a nail or plug. The botchio would then be placed in front of the client’s home to become the family’s protector. It is not my intent to appropriate African culture, as the botchio figurine stems from a religion I do not practice, but the power of imbuing meaning into objects is universal, and for that reason, I feel comfortable making this conceptual link. As mentioned earlier, the second-hand plastic horses are made by companies such as Breyer and Mattel. In my mind, they become the “carver”. When I alter the horses by reshaping their bodies, adding limbs, textures and drawn skins, I take on the role of the “shaman”. However, activation is done by the person who ends up owning the horse. 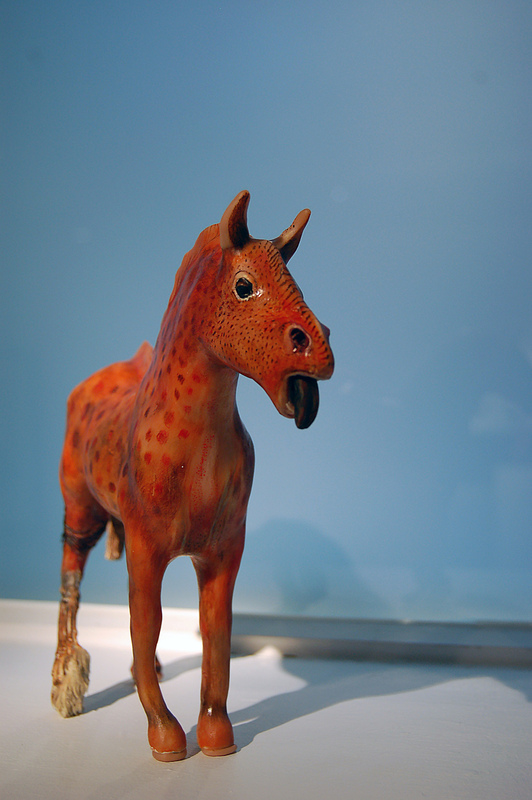 Each altered horse has a tongue that is removable. This allows the new owner to put something they believe to be magical or memorable in through the horse’s mouth, to eventually land in its belly. Once the tongue is permanently glued in place, the sculpture takes on a new invested meaning. This process of activation makes the horse the owner’s personal talisman. I have been obsessed with motorcycles since I had my first ride down the back lane on my uncle Len’s Harley at age 4. From that moment on I dreamed of owning a bike just like that one. The decades flew by and the dream remained a dream. It finally became a reality when my daughter bought me a customized 1979 Harley Sportster for my 50th birthday (Best Daughter Ever)! Since then, the obsession has grown. I hit the road every chance I get. The experience has, naturally, worked its way into my art practice. I have been doing large-scale oil pastel drawings of my bikes and those that appeal to me. I find pastel the ideal medium for this work; it is situated between painting and drawing; it allows me to work broadly and quickly; capturing the power and vitality of these machines without getting bogged down in details. There is nothing like roaring down a winding road on a bike, feeling the rush of the wind, being immersed in the sights, sounds and smells around you. I aim to relay a sense of the physicality of the experience in the muscular marks and textures on the paper; the combinations of muddy, rough, raw sections set against pristine and smooth surfaces. 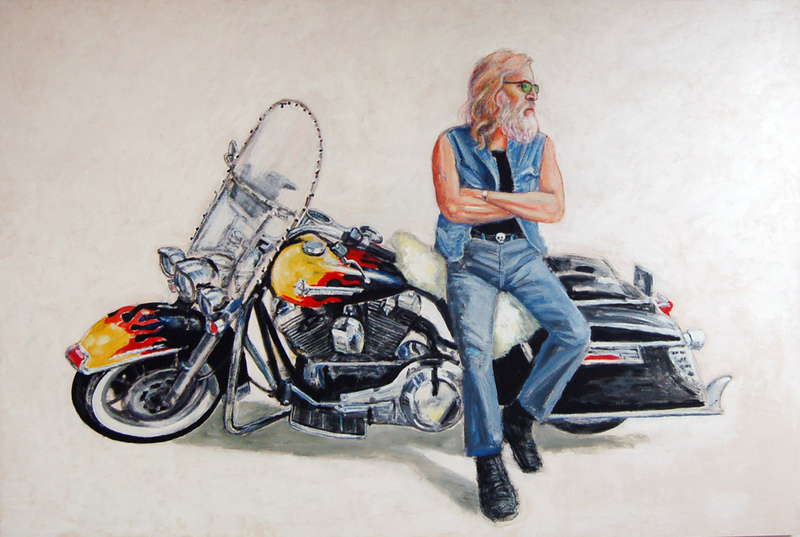 The act of drawing and painting is inspired by the primal emotions that arise as I head out on the highway and leave everything behind me, becoming immersed in the wind pushing against my face and chest, the roar of the powerful engine reverberating through my body, the sense of freedom and power that flow from the “heavy metal thunder”.